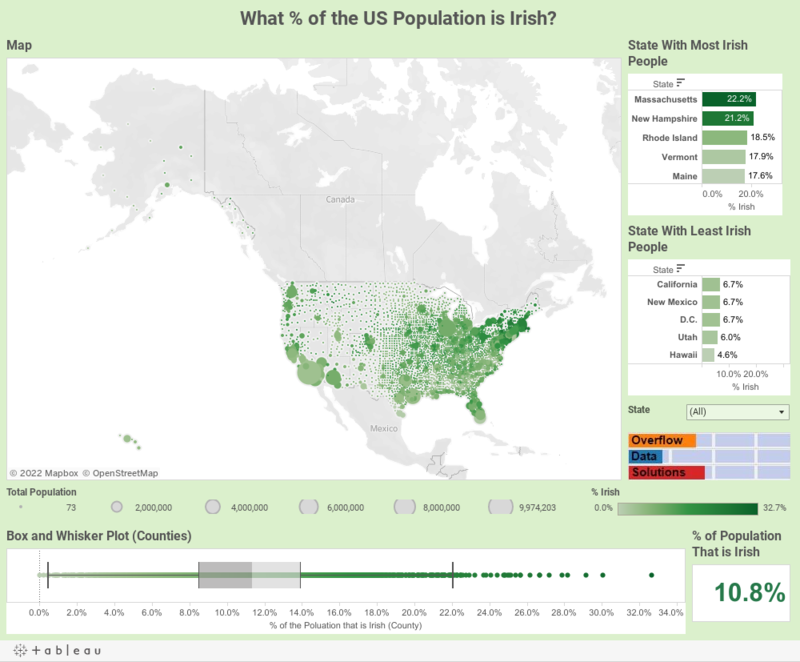 How Much of The United States Population Has Irish Heritage? It’s St. Patrick’s Day (smash that four-leaf clover emoji! ), which means throngs of drunk people are taking to the streets, drinking Guinness and posing a public safety threat to anyone not inebriated before noon. But St. Patty’s Day should really be a celebration of Irish heritage (Conor McGregor! Liam Neeson! Saoirse Ronan! The guy from Thin Lizzy! ), so this infographic showing the percentage of Irish-Americans across the United States should be a treat for all those in observance. From the data-wonks at Overflow Data comes a shamrock-green heat map, showing the percentage of people with Irish heritage in every county nationwide. According to the Census Bureau’s 2014 American Community Survey, 10.8% of the American population reports some level of Irish ancestry. These percentages are based on five year estimates per individual county. Most Irish hubs are on the East Coast, with Massachusetts laying claim to Plymouth County -- a hotbed with 32.7% of its people maintaining Irish roots. New Hampshire, Rhode Island, Vermont and Maine round out the most Irish states -- which are also home to the most insufferable sports fans in America. The composition gets decidedly less Irish going out west, as California, New Mexico, Utah and Hawaii are the least Irish states in America. Washington DC is also on the low-list, even if senator Aodhán Ó Ríordáin calls the district home. So knock yourself out with the map. It’ll be better than literally doing the same after swilling copious amounts of whiskey at the best Irish bars in America.